Article 50 has been triggered but what do exporters need to know? In a way, the actions we are witnessing between the United Kingdom and European Union are just that – a divorce. How clean cut or messy it will get is anybody’s guess. As global trade professionals, it is important to understand the implications of this divorce during and after. Sounds serious! What actually happened? Put into more formal language, the UK formally notified the European Council through Article 50, of its decision to withdraw from the trading bloc of 28 countries. Nothing like this has happened before so it’s uncharted territory. Did the UK also get a formal “no objection” document? With successful passage of the “European Union (Notification of Withdrawal) Bill 2016-17” neither the UK Parliament nor the Queen herself can provide a reason why the UK can’t officially separate from the EU. 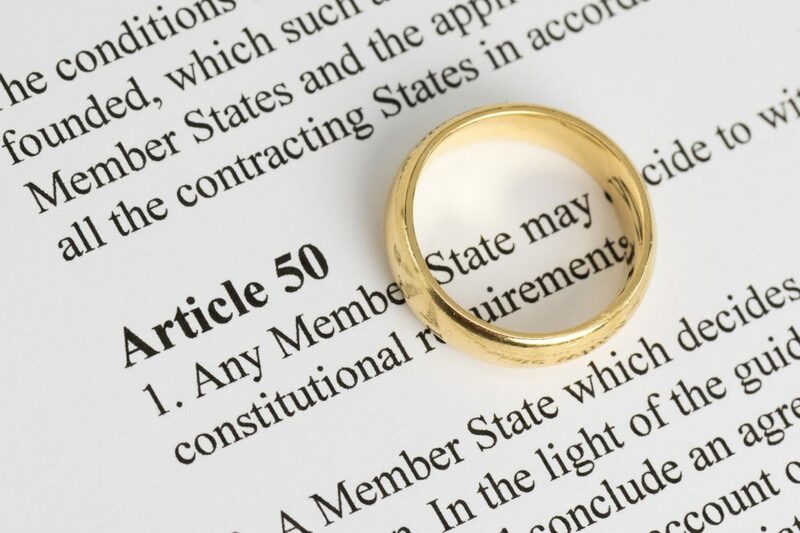 How long is the waiting period before the UK and the EU are officially divorced? Article 50 states that that EU law will automatically cease to apply in a maximum of two years from today, unless it is unanimously decided by the UK and the EU to extend this period. Everything but the kitchen sink: Will the EU and UK also conclude a settlement agreement? We hope so! Ideally, the EU and the UK should spend the next two years working on withdrawal (settlement) agreement. There’s lots to agree on beyond trade and in very little time, from financial matters, rights of EU/UK, transfer of regulatory responsibilities just to name a few. And of course, what happens with the “children”? In this case that’s Northern Ireland, Scotland, and Wales who need to decide if they want to stay with the UK or EU and there isn’t an option for co-parenting and weekend visits. What is the future relationship between the European Union and the United Kingdom? We don’t know! We do know that the UK is hoping to secure a bespoke deal that secures a high degree of access to the EU Single Market in goods and services through a Free Trade Agreement. Firstly, these negotiations are a two-way street – the EU Council, European Parliament with its veto powers, and the 27 Member States (and possibly some regional parliaments) with different interests will also have to agree to any future deal. Secondly, negotiations will not only focus on future trade arrangements. Any of the many other amazingly complex issues can derail an agreement on the future collaboration of the UK and the EU.